Want To Add The Best Plants To Your Chattanooga Pool & Patio Area? Looking for a way to freshen up your new patio, spa and pool deck? Adding foliage to your new backyard can spruce the look up, but your favorite plants may not be the way to go. Most pool owners come to find that most of their favorite plants do not survive the pool environment. Temperature plays a huge role in the survivability of plants and the area surrounding your cool pool permits too many variables for some plant life. Among the environment are potential pests drawn to specific plants you may choose, learn more about how to deal with pesky insects here. A heat absorbing pool deck, especially if dark in color, increases the temperature surrounding the pool. A temperature increase is intensified if there is little room for a breeze. If the pool is heated, as one may be in Chattanooga, the moist warm air will rise from the pool’s surface. This rise of warm, wet air will intensify the heat index. A lot of plants cannot thrive in such a humid environment. So what kind of plant life should you surround your patio with? 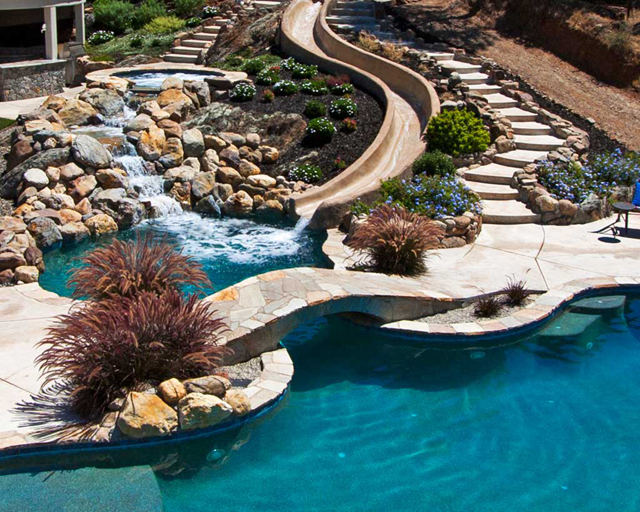 Let us help you in deciding the best options for your new pool and patio! To learn more about these specific evergreens, please follow this link. Evergreen bushes aren’t the only way you can spruce up your patio, evergreen trees offer ample shade coverage on those sunny summer days. These durable plants will give your pool and patio an incredible look year round. If you’re looking for a cascading look Creeping Jenny may be plant for you. A fast growing plant like this will give your patio a pop of color with its bright green leaves. Creeping Jennys are perennials so this fantastic look will last all year. A bit of warning about these plants though, they will take over a garden so maintenance is imperative to ensure they won’t push other plants out of the garden! For a more tropical look around your pool and patio there are some sturdy options available. Hostas produce large leaves and can vary in color. With many different varieties of Hostas, you will find that some require more attention than others but this plant is fairly low maintenance. Daylilies will also add a splash of color around your pool deck. Hybrids of this plant allow strains that can be grown in any climate. Poolside plants are the perfect final touch for bringing your backyard, quite literally, to life! Premier Pools and Spas will assist you in finding the perfect plants for your lifestyle and desired look. Contact us today for more information. Boise: Why Should You Build Pools?